The Summer of Firsts and Lasts is a sweet, fun, and poignant book. The summer camp setting is so much fun and so well described, and McVoy has captured the timeless feel of those moments where one point in time seems paramount and life-changing—for these sisters, it's their experiences at summer camp. The narrative is broken apart into rotating chapters from the point of view of each sister, which is a fun way to tell the story. McVoy does an excellent job at building the sisters' relationship, from the anecdotes from their childhood and funny nicknames, to the fights and arguments they share. Each sister stands out well: Calla is very caring and enthusiastic, but her commitment to the camp and her duties sometimes bar her from letting herself go and just enjoy the summer. Violet, though strong and unyielding when it comes to what she believes in, has a wild streak and finds herself bending the rules a bit, despite the inevitable consequences. Daisy, the best written character, is under a lot of pressure as she attempts to figure out her romance with Joel and deals with persistent bullying. She strives to take care of it all without running to her big sisters for help, but she is the one who grows the most when she learns there is a balance between being independent and accepting the support of loved ones. There is certainly a little bit of something for everyone in this delightful novel, and through all of the romance, rejection, drama, sunny days, and cool nights by the campfire, loyalty, love, and sisterhood prevail. McVoy will have readers wishing that they too could join Calla, Violet, and Daisy and Camp Callanwolde. Cover Comments: I just love this cover. The font is very simple, very fitting, and the three scoops of ice cream are so cute. Fun, bright, yet not over-the-top--it's prefect! 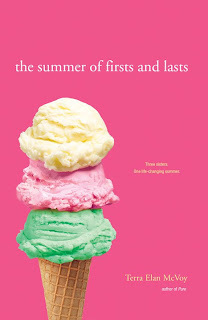 The Summer of Firsts and Lasts comes out on May 3rd, 2011! Also, please be sure to check out Pure and After the Kiss , also by Terra Elan McVoy! They're delightful books, and I just adore anything Terra writes! It sounds like a really nice read! I have it in my Wish List already. I will be keeping my eye out for this one as I liked Pure and After the Kiss.